OUR KICKSTARTER FOR 21OZ STRETCH DENIM IS SUCCESSFULLY FUNDED! We are releasing our latest and greatest denim through Kickstarter! They said it was impossible but after more than two years of design and development we are proud to offer the world’s first and only 21OZ Heavyweight Stretch Jeans. The advanced stretch feature provides a heavyweight denim that elevates flexibility, wear ability, and comfort, without compromising durability and ruggedness. You will break in the jeans without any effort and instantly feel awesome! Creating this new and unique product wasn’t easy. It was only made possible by our years of industry experience and the innovative weaving technology employed by our skilled artisans. ​There were countless revisions and seemingly endless trials, but once you try your first pair of Heavyweight Stretch Jeans we think you will agree it was worth it. HEAVY? STRETCH? or "HEAVY STRETCH"
Heavyweight Denim is associated with quality, durability, ruggedness, and other substantial characteristics. But, it is stiff and requires you so much effort and commitment to break in. Stretch Denim material, common in lightweight, gives you comfort, flexibility and more body movement. But, it won't last long and don't have much characteristic details. incorporating all the good elements and eliminating problems of both heavy and stretch denim. While you feel substantial and ruggedness, yet it is comfortable, flexible and more wearable. Whether you are a fan of heavy or stretch denim, you will love this denim! It will be your "everyday" and "long time" buddy. Versatility: Good for anywhere/anytime/any scene. The technology in making "heavyweight STRETCH denim" is very advanced and required lots of engineering. Generally, to create a stretch fabric, stretch weft yarn is woven into warp yarn. Weaving stretch yarn into a very thick indigo yarn didn’t work well. By employing a special "Double Weaving" process, skilled artisans payed extremely close attention to the exact ratio of stitches to yarn density using a special loom. Only this kind of meticulous weaving artistry made this denim possible. One day in California, we had “Denim Meet Up” with our friends who are denim lovers. We interviewed them to ask what they thought about our 21OZ STRETCH Jeans. ""I can feel the stretch a lot more than I thought" "These give you the weight with mobility which is nice." "Very substantial, solidly build, pretty well-made" "If you ride a bicycle all the time, I wanna wear this." "I like the patch." The pocket depth is appropriate." "I really like it! It's really nice detail" "This will be cool to see after wearing it for a while, and the fade." "Heavy weight, stretch, that something you never see"
This denim is right hand twill and the warp rope dyed 100% cotton so it will fade like regular heavy denim. 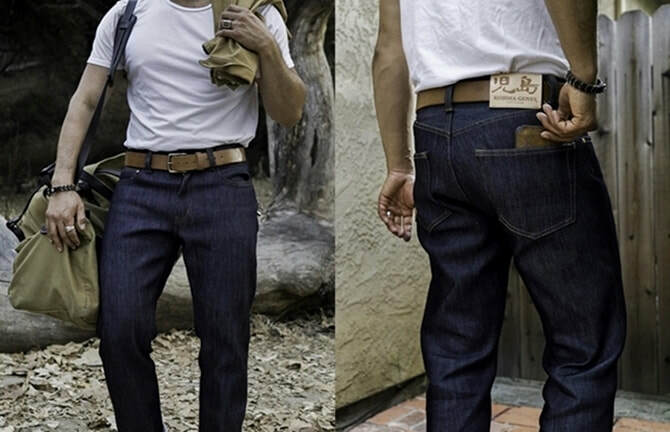 We are one of the most affordably priced “Made in Japan” denim brand and always will be. Our focus is quality and affordability. We cut down all the nonsense costs to keep it affordable, no middle agents, no big ads campaign, no celebrity endorsements. We chose Kickstarter to deliver the denim directly to you. ​This denim is durable, tough and lasts long. That means it will be gentle to the environment, and also to your wallet, instead of buying cheaper denim that lasts for only one season. A quality pair of denim will enrich your everyday life.